So…I’m Getting into Archery, and You Can Too! What am I doing to distract myself from this endless waiting for my due date to arrive (or the baby…preferably the baby)? Not sure if the baby belly takes away or adds to the coolness factor here…either way, why let pregnancy get in the way of a good time? Yes, this is the result of marrying a country boy. But truth be told, archery is something I’ve always wanted to get into. I mean, who doesn’t want to be as awesome as Katniss, with her bow wielding skills? Of course, I’ve always been an avid fantasy fan, so my interest in bows didn’t begin with Hunger Games. Books, video games, TV shows, and movies have all ignited this interest, but I thought it would be too difficult for me and too expensive. Then, a couple of months ago, we visited Thomas’ family in the country and took my brother and his girlfriend shooting. Now, as far as shooting guns goes, I think it’s important to know how to shoot, just in case protecting yourself is ever necessary. I also enjoy introducing people to it as well…especially when they first pick up that really heavy recoil rifle and feel the power behind it as they fire. Or when they take two pistols and shoot at the target with both hands while walking forward (my brother loved that). But in general, shooting guns really isn’t my thing. However, on this particular trip, our buddy Shawn brought his new hobby out as well…his grandmother’s bow (yes, the same Shawn from my recipe category Shawn and Kathleen’s Test Kitchen). Turns out both his grandmother and grandfather were award winning archers, and Shawn inherited the bow his grandmother used to win her Illinois tournament (his grandfather won in Indiana…if I’m not mistaken, before he ever met Shawn’s grandmother…how cute is that?). Shawn decided to pick up the bow and learn how to use it, so he put together a kit. And surprise, surprise, he’s very good at it. When Shawn offered to teach me how to shoot the bow, I was a little hesitant. I felt like it was kind of one of those things that I really wanted to like, but I was afraid I’d be completely terrible with it and that that would destroy the dream. But I got over that, and gave it a shot (he he). And Holy Bow Batman! Bow shooting is fun! And it’s not really that difficult. I mean, I don’t hit the target with every shot or anything (and still don’t), but the satisfaction when I do…awesome. Thomas, my terrific, amazing husband, picked up on my excitement (and I can’t lie…I dropped a lot of hints). Since my birthday is two days before the baby is due, he decided to get me an early birthday present and took me to a pro shop. I got my own bow! The entire kit (arrows, target, etc) wasn’t as expensive as I thought it would be (which is good), but it wasn’t cheap either. I know Thomas was willing to go above and beyond on this one because he knew I’d really appreciate it (which I do). I also suspect that he really enjoys shooting the bow himself, but I like that, because it’s something we can do together. So there you have it. 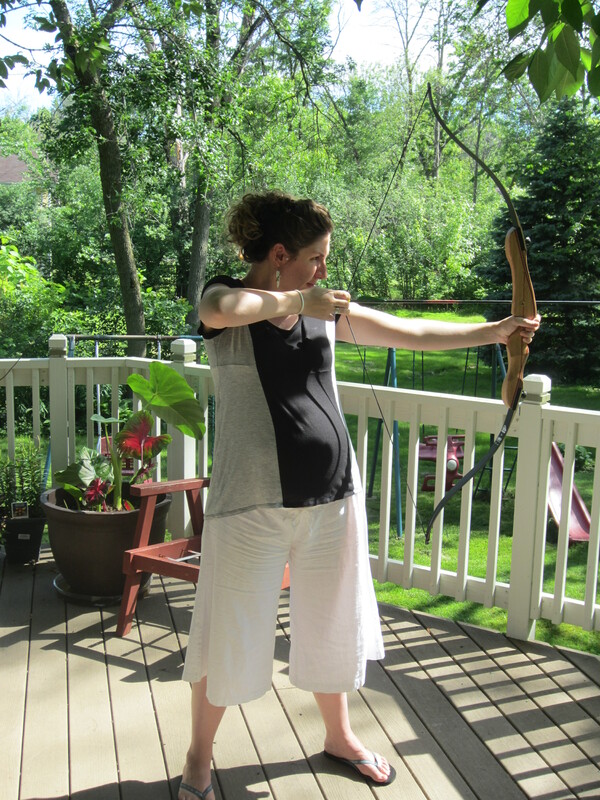 I’m eight and a half months pregnant and learning how to bow shoot. Who says pregnancy has to slow you down? (Well, it does…you just have to learn to work around your limitations). I guess I’m trying to stay near or at home as much as possible, just in case the baby comes really fast like last time, so having something to distract me, like bow shooting, is really helpful. If you’re interested in the bare necessities needed in shooting a recurve bow (as opposed to a compound bow, which is one of those bows with all the special wheels and gears for hunting…not very fantasy-like), here’s what I recommend you get to start your own kit. Please keep in mind that I’m just starting out, and I’m simply posting what has been suggested to me. You’ll want a Recurve Bow , a Bow Stringer , an Armguard (which I don’t have yet and really need to get), a reusable Archery Target (not necessary but fun and convenient to have), and a set of Arrows and Field Points (we had the guy at the pro shop put feathers on our arrows as well, and he put the field points on, so I’m not sure which brand he used). I have a 54 inch, 24 pound bow, which I’d recommend if you’re not very tall, and have an average arm strength. You’d think my arms would be pretty darn strong from carrying around a baby, but I definitely prefer the lighter poundage (the poundage refers to how difficult it is to pull back the string. The higher the poundage, the harder it is to pull, but then the arrow shoots faster/further). Also, make sure you talk to someone who can teach you how to shoot it. I suggest going to an archery range or a pro shop so that you can talk to a specialist. That way, you can stay safe. I think it goes without saying, but just in case, bows can be dangerous if handled inappropriately. That said, they aren’t nearly as difficult as I thought they’d be, so if you are interested, get a little training and you’ll be on your way too! Just don’t aim the arrows at Thomas when you begin having labor pains.